Okay, I’m clearly in Jamaica several times a year, but this trip was exceptional because I went with family and friends and also got to feel like a tourist for once. Me, Alana and Keri planned this trip a while ago for Memorial Weekend, which was perfect timing since I am moving to California tomorrow (Citrix is relocating me, yAy!). We flew in Thursday morning and stayed at my grandparents’ house for the night. I got to hang out with some friends who live in Kingston (Jason, Khadi, and Tremayne. Love you guys!). We went to Usain Bolt’s new lounge/restaurant, Tracks & Records. The place was amazing, actually. I love the energy and the vibe. They have these touchscreen tables that let you order food, play music videos and games (SO cool). I was impressed. 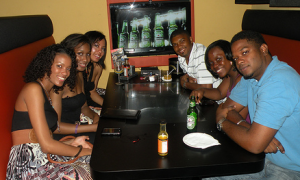 That would definitely be my #1 hangout spot if I lived in Kingston. On Friday morning, we drove to Ocho Rios to stay at Jamaica Grande for the weekend. My dad and his friends put together a collectors’ sit-in (Which they do every year) so we were able to tag along. My brother and I used to go to this hotel every summer as kids, and I imagined it as this wonderful, heavenly place since I hadn’t been there in about ten years, but the hotel was not quite the way I remembered it. It was definitely a bit run down, although still beautiful. It was crazy seeing the pools and other parts of the property that looked exactly as I remembered it. The rooms were decent, although rough in certain areas (dripping AC, broken safe box, old-school metal room keys instead of magnetic swipe cards). It didn’t stop us from having a great time though! There are 6 or so pools at the hotel, which was AWESOME. The weather was perfect the whole trip, except for a small amount of rain one day. We went to the local market and got souvenirs, hung out at the pool, got yummy mango daiquiris form the bar (mine was virgin since I’m anti-alcohol for a little while longer), stuffed our faces at the buffet, and went to a party at Margaritaville (where I ran into Deltas from Howard! They were there for their 5 year anniversary, which is also my anniversary since we all crossed in 2006). 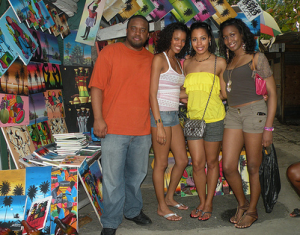 This entry was posted in Journal and tagged Jamaica, travel.